We had been contacted by the National Trust ranger for May Hill regarding the removal and burning of a large area of young birch trees. They had heard that the Dean Green Team were very experienced at doing this which is true! 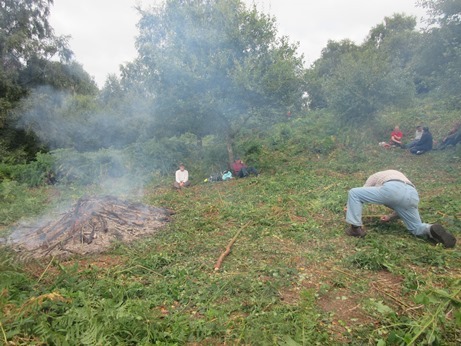 Quite a large section, about half way up the hill, had been mowed to clear the invasive bracken and we were to cut the birch to ground level so that the undergrowth there could also be cut in future. We found quite a few clumps of Fly Agaric toadstools (it's that time of year for them!) and, also, some Broom Moth caterpillars. Broom Moths inhabit open woodland and heathland and it is quite common in most of Britain. The distinctive brown and yellow striped caterpillar feeds not only on broom (Cytisus scoparius), but also on bracken (Pteridium aquilinum) and other trees and plants. 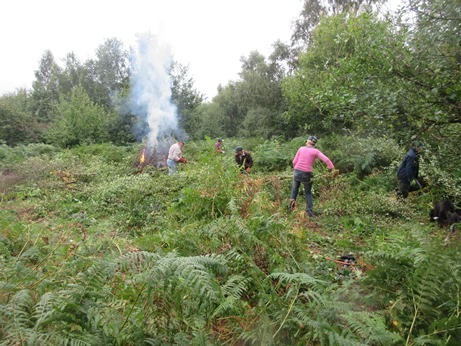 The fire was lit in a wide open space so the birch cuttings were dragged towards it. 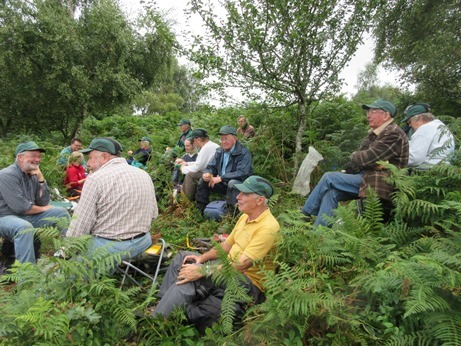 Dense bracken is clearly visible. Lunch break in the bracken! Waiting for the fire to die down.